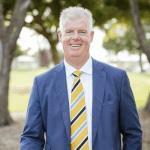 I work in a Family owned business which has been operating on the Bayside since 1978 and Ray White has 1000 offices and has been around since 1902 so you have the benefit of a massive organisation working with you to ensure outstanding results. We have a team of 11 selling agents in our office and we all share our listings with each other to ensure that we do not just sell your property but sell it for the highest possible price as we all have many buyers on our databases to choose from. Our office has been in the top 10 Queensland offices now for around the last 15 years and we sell over $85,000,000 worth of property each year. Every property is different and each needs it's very own marketing approach as I truly believe there is no "one size fits all" in real estate as homes do not have a RRP as the price is determined by world class marketing strategies coupled with an agent who is a great negotiator.